In the late 1960s you could buy stereo speakers with built-in colored lights that flashed in response to the music, allowing any owner to create a kaleidoscopic nightclub show right at home. 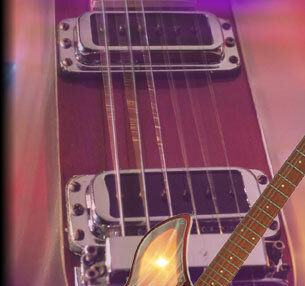 The idea was likewise used in electronic organs, but Rickenbacker reasoned that such a gimmicky light show could also be easily adapted to an electric guitar by concealing small colored lights in the body beneath panels of frosted plastic. As with the speakers, the lights in the Rickenbacker 331 model flashed in response to different pitches played on the guitar. A separate transformer was used to supply electricity to the lights, but the arrangement is said to have been prone to overheating. Although this guitar seems best suited to bands clinging to the psychedelic fad of the previous decade, it was country guitarist Buck Owens who most often showed of the instrument on the corny television show Hee Haw. Like most fads, the light-show guitar was quite short lived, and was manufactured only between 1970 and 1975. I don't use effects. I tried a wah-wah pedal once. Stubbed my toe on it.